Just yesterday, the circular route from Vilafranca del Penedès to our cellar was inaugurated. This proposal reflects the will to offer our customers and visitors to the Penedès a new way to carry out wine tourism by respecting nature, doing gentle sport and starting the visit from the vineyard. In this way visitors arrive relaxed, with no rush, at their own rhythm, integrated with nature and with inner peace. 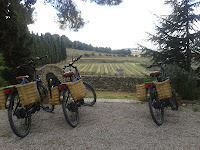 The route is designed for groups, families or couples who want to spend a day in the Penedès in a 100% sustainable way: they can get to Vilafranca by public transport and take the route on a burricleta from Vilafranca to our cellar amongst the vines, where they can enjoy great views and taste wines. They can have a picnic along the way or in a restaurant and pedal back to Vilafranca through a new route. The proposal follows our philosophy, where we respect and love nature and the environment ... The increase in the demand for ecological and sustainable leisure activities has been the reason we have looked for new formulas, to satisfy those visitors who are looking for something different, original and experimental. The burricleta has a GPS with audio-guide so that the group can go off alone, without getting lost, setting their own pace. At some strategic points along the route we can hear about the places we are at and get some cultural knowledge about the area. An entire experience amongst the vines!